Night Owl CAM-IH8-BA - Network Surveillance Camera - Outdoor, Indoor - WeatherproofIntroducing Night Owl's Add-on 4K Ultra HD Wired IP Camera with L2 Color Boost Technology and Rapid Image Detection Technology (RID). 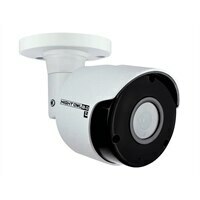 This IP based video security camera is ideal for protecting and monitoring your home or business. The camera is sold as an add-on and requires your IH8.0 Series NVR. The camera produces mind-blowing 4K Ultra HD video and continues recording in full color in low-light settings. As light fades, the camera records in full color utilizing your L2 Color Boost Technology, only switching to Night Vision when necessary. Using Rapid Image Detection Technology (RID), this intelligent camera minimizes false alerts by distinguishing true threats from non-threats like rain, wind, and bugs. Whenever real motion events are detected, the camera will immediately send push alerts to your Smart Device. With Night Owl's free and exclusive App, you can easily view your camera from anywhere in the world! Introducing Night Owl's Add-on 4K Ultra HD Wired IP Camera with L2 Color Boost Technology and Rapid Image Detection Technology (RID). This IP based video security camera is ideal for protecting and monitoring your home or business. The camera is sold as an add-on and requires your IH8.0 Series NVR. The camera produces mind-blowing 4K Ultra HD video and continues recording in full color in low-light settings. As light fades, the camera records in full color utilizing your L2 Color Boost Technology, only switching to Night Vision when necessary. Using Rapid Image Detection Technology (RID), this intelligent camera minimizes false alerts by distinguishing true threats from non-threats like rain, wind, and bugs. Whenever real motion events are detected, the camera will immediately send push alerts to your Smart Device. With Night Owl's free and exclusive App, you can easily view your camera from anywhere in the world!